Posted on 2016-03-10, 15:58, by bjorn, under Uncategorized. On the top level this gives me a map as shown below. The different colours represent different source IP addresses, and some of the destination ports are shown where there’s room for it. As the yellow part of the tree map shows, there’s a lot of activity from the IP address 193.169.52.214, with 7121 attempts (so far) to establish outbound TCP connections. The blue part of the map represents another IP address with a higher number of connection attempts, but its activity is less varied than the yellow part. The number of attempts is shown by hovering the mouse over the general areas (not here though, since this is just a screenshot…). By hovering the mouse over the port numbers, the map shows that of these 7121 attempts, 3763 have targeted port 25 on a lot of destination systems, each system represented by a rectangle within the yellow area. As we can see, this IP address has also attempted to connect to servers on ports 26, 80, 443, 465, 587, 777, 2525, and 25000. Clicking on the yellow part of the map, we’re drilling down to the activity of each originating IP address. Where there’s room for it, this map shows the target IP addresses, i.e. where the bot has attempted to establish connections. The map now focuses on the yellow area only, i.e. the activity from only one IP address. The map is still divided into rectangles, representing target ports. At this level, the destination ports are visible when hovering the mouse over the different general areas of the map. 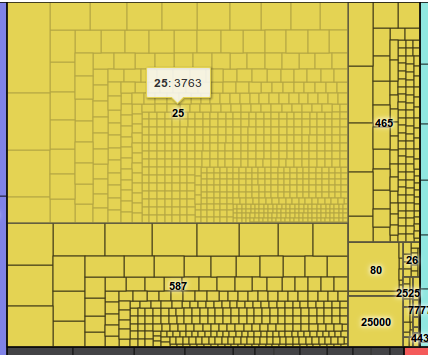 The biggest upper left area is towards port 25, lower left is port 587, upper right is port 465, and in the lower right corner we find less frequently attempted ports like 80, 25000, 2525 etc. By hovering over an IP address, the map will show the number of attempted connections against that IP address and port.